The Hanoverian Scenthound originated in Germany. It has developed nearly unchanged from the so-called Liam Hound of the early middle Ages. With the invention of firearms, dogs were needed to search for wounded game. 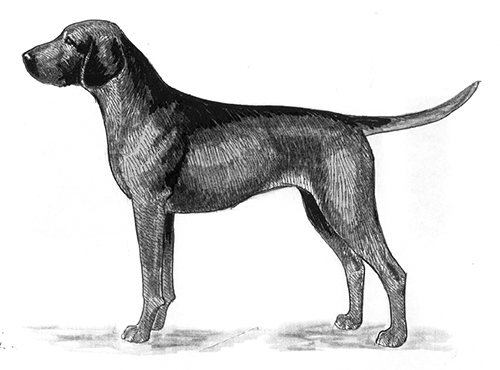 The Hanoverian Hunting Estate in the kingdom of Hannover developed this hound and their breeding has been strictly with regard to their working ability. They are used exclusively as specialists for tracking cloven hoofed game. 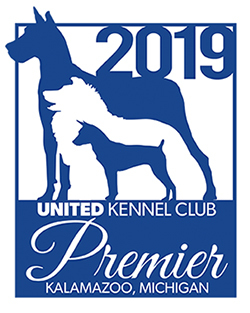 The Hanoverian was recognized by the United Kennel Club January 1, 1996. A medium sized, well proportioned, and powerful breed, well suited for work. Calm and assured, with a high capability to concentrate on any track. The forehead is slightly wrinkled. The skull is broadest between the ears, and slightly rounded. The occiput is not prominent. The stop is strongly pronounced, especially in males. The muzzle is strong, deep and broad, as long as the skull. The lips are broad, pendulous and well rounded. The cheeks are strongly muscled. The Hanoverian has a complete set of evenly spaced, white teeth meeting in a scissors or level bite. Faults: Undershot or overshot bite. Broad and usually black, but occasionally dark brown. The eyes are dark brown, with well fitted lids. The ears are set on high. They are broad and smooth, hanging close to the head without a twist. The neck is long and strong. The skin on the throat is loose. A slight dewlap is permissible. The shoulder blades are flat, close and well laid back. The upper arms are long, setting the legs under the body. The legs are straight and often stand fairly close together. The length of the leg, from the elbow to the ground, is one-half the height at the withers. The elbows set close to the body. The pasterns are sloping. The body is slightly longer than tall. The chest is deep rather than broad. The back is strong, and the topline is long. The loin is broad and pliable, with a slight arch. The croup is long, broad and slightly sloping. There is a slight tuck up that rises gradually. The hindquarters are well angulated. The pelvis is broad and capacious. The upper thighs are strongly muscled. The stifle is well angulated, and the lower thigh is straight and lean. The hock joint is broad and strong, and the rear pasterns are vertical. Strong and round, with large, thick pads and well arched toes. High set, long and barely curved, tapering to the tip. The coat is short and thick, coarse to harsh. Somewhat longer and coarser on the back of the thighs and underside of tail. Light to dark deer red, more or less intensely brindled, with or without a face mask. Small white patches on the chest are tolerated. Height for males is 19.5 to 21.5 inches at the withers. For females, it is 19 to 21 inches. Weight for males is 66 to 88 pounds. For females, it is 55 to 77 pounds. Flexible and ground covering, with strong drive.